Here is the list of the hotels near Beaulieu. Book your hotel near Beaulieu today, Thursday 16 May for the best price, reservation and cancellation free of charge thanks to our partner Booking.com, leader in on-line hotels reservation. Below here is the list the 50 closest hotels of Beaulieu, sortable according your criteria. You will find the position of these accommodations on the Beaulieu hotels map. Maison De Vacances - Champallement is set in Montenoison and offers barbecue facilities. Guests staying at this holiday home have access to a fully equipped kitchen. The holiday home has 5 bedrooms and a living room with a TV and DVD player. Maison De Vacances - Champallement offers a children's playground. A garden and a terrace are offered at the property. Nevers is 47 km from the accommodation, while Sainte-Marie is 20 km from the property. A farm with cattle and fields of wheat and rapeseed, Chambres d’hôtes - Domaine des Perrières is located 100 metres from Aron River and the forest. It offers a garden with a seating area, a furnished terrace and uniquely-decorated rooms with views of the countryside. The heated rooms at Chambres d’hôtes - Domaine des Perrières include a private bathroom with a shower, a hairdryer and free toiletries. They also have parquet flooring and antique furniture. The continental breakfast provides bread, jams and homemade cakes. Guests can also request a regional, homemade meal which can be gluten free or organic. The property is 12 km from Etang de Vaux, 47 km from the city of Nevers and 49 km from Vezelay. There is a free, private car park on site. Situated in Crux-la-Ville in the Burgundy region, Le Vieux Château features a garden. The accommodation is 39 km from Nevers. The holiday home comes with 4 bedrooms and a fully fitted kitchen with a dishwasher and an oven. The holiday home offers a barbecue. Sainte-Marie is 11 km from Le Vieux Chateau Moussy. Featuring a garden, a terrace, and a shared lounge, Chambre à Part- La Yourte features accommodation in Corvol-dʼEmbernard with free WiFi and garden views. The air-conditioned accommodation is 45 km from Nevers. The tented camp features a TV. A continental breakfast can be enjoyed at the property. A bicycle rental service is available at this property and cycling can be enjoyed nearby. Sainte-Marie is 29 km from the tented camp, while Vézelay is 46 km away. Le Moulin is located in Chitry-les-Mines. This holiday home features a garden and barbecue facilities. The holiday home comes with 1 bedroom and a fully fitted kitchen with an oven. The holiday home offers a terrace. Avallon is 40 km from Le Moulin, while Sainte-Marie is 37 km away. Set in the heart of an historic town, right in the old centre, this hotel welcomes you for an unforgettable experience in a typical house of Burgundy. The main entrance is directly connected with a charming reception desk and a central indoor terrace. The Logis de l’Europe features 18 comfortable guest rooms with floral theme decor. All of them are accessible via a lift. The Logis also offers gastronomic cuisine in one of its 3 restaurants available on site. Tasty meals and fresh produce are served in the dining rooms decorated in a typical style or on the flowered terrace when the weather is fine. Maison De Vacances - Crux-La-Ville is located in Crux-la-Ville and offers barbecue facilities. Complimentary WiFi is provided. The holiday home includes 2 bedrooms and a kitchen with a dishwasher and an oven. A TV is featured. The holiday home offers a children's playground. A garden and a terrace are available at the property. Nevers is 40 km from Maison De Vacances - Crux-La-Ville, while Sainte-Marie is 8 km from the property. Located in Vignol, Maison de vacances - VIGNOL provides accommodation with a private pool. Guests staying at this holiday home have access to a fully equipped kitchen. The holiday home features a TV and 2 bedrooms. The holiday home offers a barbecue. This property offers a terrace. Avallon is 33 km from Maison de vacances - VIGNOL. 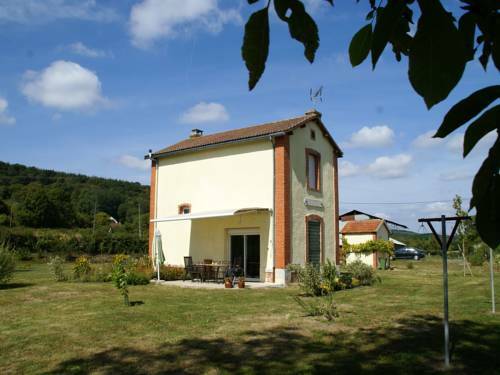 Maison De Vacances - Tannay is located in Vignol and offers barbecue facilities. The accommodation is 35 km from Avallon. The holiday home includes 2 bedrooms and a kitchen with an oven and a microwave. A TV and DVD player are featured. Guests can also relax in the garden. Sainte-Marie is 44 km from the holiday home, while Vézelay is 25 km away. Set in an orchard 600 metres outside the village of Ouagne, Le Relais de Maufront offers self-catering wooden caravans. Guests can relax by the outdoor swimming pool in the warmer months and enjoy the seasonal vegetables and herbs from the garden. The wooden caravans at Le Relais de Maufront offer wood-panelled walls and are heated with an electric fireplace. Free Wi-Fi, barbecue facilities and a bathroom with a shower are provided in the caravans. A continental breakfast is served every morning upon request, and guests can prepare homemade meals in the equipped kitchenette. Upon request, the hosts can prepare evening meals for guests featuring fresh, regional products. New Year's Eve dinner can also be requested. The Clamecy Train Station is 10 km away and Canal Nivernais is 20 minutes away. A children’s playground with a small caravan, sandpit and other activities is available on site, and free private parking is possible at the property. Located in Vignol, Villa Anna Tuinmanswoning is 29 km from Avallon. It offers a garden, an outdoor swimming pool and a terrace with sun beds. Free Wi-Fi access is provided. This cottage offers a balcony with shared pool and garden views. A washing machine and a tumble dryer are at guests’ disposal and the bathroom includes free toiletries, a hairdryer and a spa bath. The kitchen is complete with an oven, a microwave and a dishwasher. A fridge, a coffee machine and a stove are also available. Guests can enjoy a game of table tennis at Villa Anna Tuinmanswoning, which is 16 km from the Vézelay and and 18.5 km from Bazoches Castle. Clamecy is 22 km away. The property offers free private parking. This B&B is set in the village of Prémery in the heart of Bourgogne and features blue-shuttered windows and individually decorated rooms. Guests are free to relax on the garden terrace. Each colourful room includes free Wi-Fi and large windows offering views of the village or the countryside. Some rooms have direct access to the terrace, or open up to a private balcony. Breakfast can be enjoyed every morning in Chambres ed’Hôtes La Chatelière’s breakfast area or in the comfort of guest rooms. Evening meals can be prepared by the host upon request. Guests have the choice of adding a TV to their rooms, and the host can help organise guided tours and hiking trips in the area. Free parking is available and the city of Nevers with its train station is 30 km away. The B&B is a 40-minute drive from both Clamecy and Corbigny. Surrounded by countryside and orchards in the Burgundy region, this former manor is 1.8 km from the village of Saint-Saulge. Free Wi-Fi access is provided in the en suite guest rooms. The spacious guest rooms at Domaine de Savigny have a seating area with a fireplace and views of the grounds. A private bathroom with shower is also provided. A continental breakfast is offered every day. Guests can also share set menus with their hosts on request. Domaine de Savigny is 36 km from Nevers and 32 km from the A77 motorway. There is free on-site parking. Hotel Camping Sur Yonne in Épiry has 2-star accommodation with a garden and a terrace. Among the various facilities are a shared lounge and a bar. Both free WiFi and private parking are accessible on site. At the hotel, each room is equipped with a wardrobe. Some rooms will provide you with a kitchen with a fridge. A continental breakfast is served every morning at the property. Evening meals can be prepared upon prior request before 10:00. Guests at Hotel Camping Sur Yonne will be able to enjoy activities in and around Épiry, like cycling. Avallon is 36 km from the accommodation, while Nevers is 48 km from the property. Set 14 km from Vézelay Basilica in Neuffontaines, Oniros features free WiFi access and free private parking. You will find a coffee machine and a kettle in the room. Rooms have a private bathroom. Offering free WiFi and garden views, Le Bonheur is an accommodation located in Breugnon. Housed in a building dating from 17th century, the bed and breakfast is in an area where guests can engage in activities such as cycling and hiking. The bed and breakfast features a flat-screen TV. A continental breakfast is available daily at the property. The bed and breakfast offers a terrace. Guests can relax in the garden at the property. Auxerre is 49 km from Le Bonheur, while Avallon is 48 km from the property. Sitting in a valley in Anthien, Domaine de Drémont is a working farm with unrestricted views of the countryside, and has a large garden, swimming and fishing pond as well as a terrace. Vézelay is only 16 km away and Château de Bazoches is 6 km from the property. Accessed by a private entrance, all rooms are fully furnished and are decorated in a traditional Burgundian style. They feature a wardrobe, tiled flooring, a desk and a bathroom. A breakfast consisting of homemade or local products is prepared each morning at Domaine de Drémont. Guests also have access to a shared kitchen, which includes an oven, microwave and electric kettle as well as access to the living room with a fireplace. Additional features include free Wi-Fi access throughout and free private parking on site. Set 800 metres from the Canal du Nivernais, Hôtel Restaurant La Manse is just 4 km from the centre of Clamecy and 14 km from Vézelay. It is located in the countryside and offers a terrace and a bar. Views of the countryside are provided in all of the en suite rooms at Hôtel Restaurant La Manse. They are decorated in bright colours and also include a TV with satellite channels. A buffet breakfast is served in the dining room. The hotel also has an on-site restaurant specialising in French and local cuisine, as well as set menus. Guests can choose to have breakfast and an evening meal included. Free Wi-Fi access and newspapers at reception are also available at this property. Free public parking is conveniently available on site and Auxerre is a 40-minute drive away. Bed and Breakfast Lormes Preferred hotel ! Offering an equipped kitchen and children's playground, Cottage des Aubues is situated in Lormes in the Burgundy Region, 30 km from Avallon. Free WiFi is offered throughout the property and free private parking is available on site. The rooms have a flat-screen TV and a coffee machine. Some units include a seating area to relax in after a busy day. You will have access to a shared kitchen on-site. A barbecue is also available. Free use of bicycles is available at this bed and breakfast and the area is popular for cycling and hiking. Sainte-Marie is 34 km from Gite des Vauclins, while Vézelay is 18 km away. Gites des Aubues is located in the heart of the Morvan Regional Park and is set in a stone house. The three-bedroom cottage is decorated in a traditional-style and features stone walls, an original fireplace and a furnished terrace. The heated accommodation also offers parquet or tiled flooring, a TV with a DVD player and free Wi-fi access. The bathroom is fitted with a shower and a hairdryer. The open-plan kitchen has a dishwasher, a coffee machine and a toaster. Barbecue facilities are also here, at guests’ disposal. A children’s playground is available on site and horse riding is available for an extra fee. Activities in the area include hiking on the GR13, cycling and visiting Clamecy, 35 km away. Corbugny Train Station is situated 13 km away. Situated in Colméry, Kimaro Farmhouse Holiday Cottage features accommodation with a terrace and free WiFi. With garden views, this accommodation offers a patio. The holiday home features 2 bedrooms, a kitchen with an oven, a washing machine, and 1 bathroom. Guests can also relax in the garden. Sainte-Marie is 34 km from Kimaro Farmhouse Holiday Cottage, while Cosne-Cours-sur-Loire is 39 km away. Guest accommodation Colméry Preferred hotel ! Boasting accommodation with a terrace, Kimaro Farmhouse is located in Colméry. The tented camp, set in a building dating from 19th century, features free WiFi. There is a seating area and a kitchen equipped with a fridge. The tented camp offers a barbecue. Guests can relax in the garden at the property. Sainte-Marie is 34 km from Kimaro Farmhouse, while Cosne-Cours-sur-Loire is 39 km away. Providing a terrace and free WiFi, Manoir du Chagnot offers accommodation in Mont-et-Marré. There is a seating and a dining area in all units. A continental, vegetarian or gluten-free breakfast is available daily at the property. A bicycle rental service is available at the bed and breakfast. Nevers is 46 km from Manoir du Chagnot, while Sainte-Marie is 22 km from the property. Set in Saint-Malo-en-Donziois, Le Beauchot offers accommodation with a private pool and private parking. Guests staying at this country house have access to a fully equipped kitchen and a terrace. The country house is equipped with a flat-screen TV. The property also has 2 bathrooms is fitted with a shower. Sainte-Marie is 34 km from the country house, while Cosne-Cours-sur-Loire is 36 km away. Hôtel Restaurant Perreau is situated in Lormes. Free WiFi is at guests' disposal. At the hotel, every room is fitted with a wardrobe, a flat-screen TV and a private bathroom. A buffet breakfast is available each morning at the property. The restaurant at Hôtel Restaurant Perreau serves French cuisine. Avallon is 28 km from the accommodation. Situated just 5 minutes from Clamecy historic centre, this 3-star hotel is 750 metres from Vaubert Park. It offers individually decorated, modern guest rooms and features a bar and restaurant. All guest rooms are equipped with a flat-screen TV with satellite channels. Each room has a private bathroom fitted with a hairdryer. Free Wi-Fi connection is available throughout the hotel. A buffet breakfast is served every morning at the Hostellerie De La Poste. The hotel restaurant also features a terrace in the interior courtyard. With bike rental available on site, Hostellerie De La Poste is just 2 minutes from the Museum of Art and History. Auxerre is a 40-minute drive away. Maison Pouilly is set in Fontenay-près-Vézelay and offers barbecue facilities. This holiday home offers accommodation with free WiFi. The holiday home is fitted with 3 bedrooms and a fully fitted kitchen with a dishwasher. Guests can relax in the garden at the property. Avallon is 28 km from the holiday home, while Vézelay is 15 km from the property. Set in a former barn built in the 18th century and located a 15-minute drive from Vézelay, Au cheval bleu is a guest house with exposed beams and stone walls. The rooms are decorated in an elegant style. The heated rooms at Au cheval bleu feature parquet flooring and a private bathroom with bath or shower. A continental breakfast is available every morning and can be sampled on the terrace when the weather is fine. Free Wi-Fi access is provided in the public areas and the guest house is situated 50 metres from St-James Way. The property is set in the Morvan Natural Park, which offers hiking paths. Les Roulottes Du Bazois is located in the centre of Châtillon-en-Bazois, 27 km from Chateau-Chinon. Sainte-Marie is 18 km away. Free private parking is available on site. Featuring a terrace, each mobil home is fitted with a seating and dining area. Some unit also has a kitchen equipped with a microwave, a coffee machine and a fridge. Each accommodation features a private bathroom with a shower and toilet. The property also offers packed lunches. You can play tennis at the property, and bike hire is available. Nevers is 38 km from Les Roulottes Du Bazois while Vézelay is 46 km away. Au Foudre du bazois features barbecue facilities, terrace and shared lounge in Châtillon-en-Bazois. The accommodation provides free WiFi. Nevers is 38 km away. The rooms at the hotel are equipped with a private bathroom and a flat-screen TV. Some rooms have a seating area and a kitchen. A shared kitchen is available on the ground floor. You can play table tennis at the accommodation, and the area is popular for fishing, canoe-kayaking and hiking. Aron River and Nivernais Canal are a 2-minute walk away. The property is 58 km from Vézelay and 50 km from Magny Cours. Situated in a hamlet of Saint-Martin-du-Puy in the Burgundy Region, 19 km from Avallon, La Grande Maison du Morvan boasts a sun terrace and views of the garden. Free private parking is available on site. La Grande Maison du Morvan features free WiFi throughout the property. There is a shared lounge at the property. The area is popular for horse riding and cycling. Sainte-Marie is 38 km from La Grande Maison du Morvan, while Vézelay is 23 km away. Gite Vezelay is located in Chamoux. The holiday home features garden views and is 49 km from Auxerre. This holiday home is equipped with 2 bedrooms, a living room and a fully equipped kitchen with an oven. A flat-screen TV is offered. Avallon is 25 km from the holiday home. Set in Fontenay-près-Vézelay in the Burgundy region, Au Moulin De Vezelay has a garden. Housed in a building dating from 19th century, this bed and breakfast offers free WiFi. A continental breakfast can be enjoyed at the property. The bed and breakfast offers a seasonal outdoor pool. Guests at the property can enjoy darts on site, or cycling in the surroundings. Avallon is 21 km from AU MOULIN DE VEZELAY, while Vézelay is 8 km away. Located in Gâcogne in the Burgundy region, Holiday home Gacogne features a garden. Guests staying at this holiday home have access to a fully equipped kitchen. Providing access to a terrace, the holiday home consists of 4 bedrooms. A TV is provided. The holiday home offers a barbecue. Avallon is 40 km from Holiday home Gacogne. Situated in Saint-Sulpice in the Burgundy region, Holiday Home St. Jean Aux Amognes with a Fireplace 08 is a 3-star property featuring free WiFi. Guests staying at this holiday home have access to a fully equipped kitchenette. The holiday home features a TV and a living room. The holiday home offers a children's playground. Nevers is 19 km from Holiday Home St. Jean Aux Amognes with a Fireplace 08. Boasting a garden, L'Escale du Banquet provides accommodation in Mhère with free WiFi and garden views. Guests have a private terrace. The bed and breakfast includes a living room with a flat-screen TV and a DVD player. A continental breakfast is available every morning at the bed and breakfast. Languages spoken at the 24-hour front desk include English and French. Avallon is 41 km from L'Escale du Banquet, while Vézelay is 41 km away. Featuring a swimming pool, a garden and a terrace and views of the mountain, Château de Poussignol is located in Blismes and features accommodation with free WiFi. There is also a kitchenette in some of the units equipped with a microwave and a fridge. A continental breakfast is available every morning at the property. Guests can also relax in the shared lounge area. Sainte-Marie is 46 km from the bed and breakfast. Holiday home St Sulpice H-756 is set in Saint-Sulpice. The accommodation is 19 km from Nevers. This holiday home comes with a living room and a fully equipped kitchen with a dishwasher. Sainte-Marie is 16 km from the holiday home. Set in the Morvan Regional Natural Park, La Maison de Cure is located in Domecy-sur-Cure, 11 km from Vézelay. The property features a terrace and views of the garden. Free private parking is available on site. A breakfast is served every morning at la Maison de Cure. You will find French artisan crafts at the property's gift shop. An array of activities are offered in the area, such as fishing and hiking. A Spa is available at a 30-minute drive from the property. Avallon is 15 km from La Maison de Cure, while Saulieu is 46 km from the property. Lyonesse is located in Montigny-en-Morvan and offers barbecue facilities, a garden and a terrace. This property offers access to free WiFi. The holiday home is fitted with 4 bedrooms and a fully fitted kitchen with an oven. A TV and DVD player are provided. At the holiday home guests are welcome to take advantage of a sauna. A bicycle rental service is available at Lyonesse. Sainte-Marie is 42 km from the accommodation, while Vézelay is 50 km away. Le Relais du Morvan is located in the city centre of Vezelay, set within the Morvan Natural Regional Park. It offers free Wi-Fi access and a traditional French restaurant on site, serving local specialities. Each room includes a flat-screen TV with cable channels and a private bathroom with a bath or shower. A buffet continental breakfast is served daily and newspapers are available. Le Relais du Morvan is 700 metres from Vezelay Abbey and the town of Avallon is a 15-minute drive away. It is also an ideal place to stop when touring the Burgundy wine region. Former coach house, this hotel is situated in the heart of the Vézelay area. Well-known in the area, it accommodated the actors in the famous French movie La Grande Vadrouille. The Hotel de la Poste et du Lion d’Or features 38 guest rooms including suites. Each room is air-conditioned and fitted with television and free Wi-Fi Internet access. Standing near the Sainte Marie-Madeleine Basilica, this hotel allows you to fully discover this historic landmark and a charming area. The Hotel de la Poste et du Lion d’Or also has meeting and dinner rooms: the ideal solution to organise business or private events. Located on Saint-James’ Way and set in an old property, Le Compostelle offers a terrace and en suite rooms with a flat-screen, satellite TV. The breakfast room features a panoramic view of the garden. The heated rooms at Le Compostelle have parquet flooring. The bathroom includes free toiletries and free Wi-Fi access is provided in each of them. The continental breakfast can be brought to the comfort of your room. Guests can also enjoy a drink at the hotel’s bar. A traditional restaurant can be found within 200 metres. The accommodation is situated 700 metres from Abbaye de Vézelay and 13 km from Château de Bazoches. The city of Clamecy is 23 km away. Pressoir de l'abbaye is a property set in Vézelay near Vézelay Basilica. Guests may enjoy free WiFi. A continental breakfast is served every morning at the property. Guest accommodation Blismes Preferred hotel ! Situated in Blismes, Maison Lavande offers accommodation with a private pool. This property offers access to a terrace. The holiday home includes 2 bedrooms, a kitchen with a dishwasher and an oven, as well as a coffee machine. A flat-screen TV with satellite channels is provided. The holiday home offers a seasonal outdoor pool. Guests can relax in the garden at the property. Sainte-Marie is 40 km from Maison Lavande, while Autun is 48 km from the property. The Good Studio Vezelay is a self-catering accommodation located in Vézelay. FreeWiFi access is available. The property is 200 metres from Vézelay Basilica. There is a fully equipped kitchenette with a microwave and a refrigerator. A shower and hairdryer are available. Extras include a washing machine and bed linen. Set in a 17th-century building, Sy Les Glycines is a boutique hotel offering accommodation in the heart of Vézelay, a short walk from the central square and the Basilica. The rooms are equipped with a flat-screen TV. The rooms have a private bathroom. For your comfort, you will find free toiletries and a hairdryer. Guests arriving after check-in hours can find an evening meal in the room's minibar if they reserve in advance. Breakfast with cold and hot options can be enjoyed daily. Freshly made meals are proposed at the bistro restaurant, operated by the property. A bar and a shared lounge are at your disposal. Below here is the hotels map of Beaulieu. Names and details of Beaulieu hotels can be shown on the map clicking on the prices icons.